Despite losing to the Brewers 5-4 on Thursday, the Chicago Cubs became the first team this year to clinch a playoff spot when the St. Louis Cardinals also lost, thereby handing the NL Central to the Cubs. This marks the second straight season the Cubbies have made it to the postseason, last year bowing out in four straight in the NLCS to the Mets. Can Chicago get back to the NLCS and this time figure out how to earn a win or two — or maybe even make it to the World Series — for the first time since 1945? Of course, that would just be half the battle. Actually winning it all has been a challenge, as you’ve got to go back to 1908 to find the last time this team won it all. To say they’re due is the understatement of the century. But if they can pull it off it will be hard evidence that Theo Epstein, the team’s President of Baseball Operations, is the smartest mofo to have ever lived for he’ll have broken baseball’s two longest championship droughts, having already done so for the BoSox. Let’s review some of the more interesting Fantasy worthy stories coming out of WrigleyLand recently. Veteran catcher Miguel Montero has seen his value plummet this season, but he’s getting more PT recently and why not? The dude is hot, and capped Friday’s win when he smacked a walk-off homer. The emergence of Willson Contreras has left Montero scrambling for periodic starts, and thanks to injuries and ineffectiveness, it’s not as if Montero has put up much of a fight in this position battle. But Montero has delivered three hits and two walks over the last two games, is now batting .273 over the last week and is enjoying his best month of the season despite reduced PT. Now that the Cubs are assured of being in the dance, it’ll be interesting to see if Montero keeps seeing starts. If so, give him some consideration in deeper NL-only leagues. 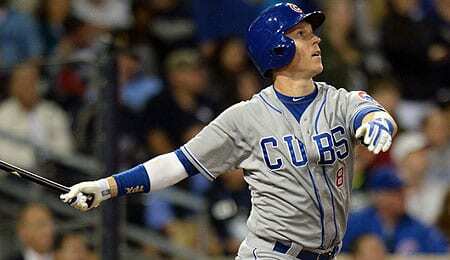 Another veteran that has looked awful and also battled injuries this year is outfielder Chris Coghlan. In his first action in nine days, he delivered three hits, two runs and an RBI on Friday, but this compensation first round pick in 2006 by the Marlins has seen precious little PT in the second half. Of course, his 485 OPS this month isn’t exactly begging for more at-bats. Coghlan enjoyed a couple decent seasons with the Cubs the last two years, but this season — after being dealt to Oakland in the offseason — his extra-base pop regressed dramatically. Traded back to the Cubs in June, he hasn’t seen as much action on a deeper roster, but he’s actually wound up scoring more runs and has delivered the periodic key hit (see video below). Overall, however, this has been a lost season for him as he’s been pushed to a more peripheral role. Injuries didn’t help matters, but Coghlan is in danger of being rendered completely useless in all formats. One Cub whose stock is rising, and is likely to see more PT now that the Cubs have clinched is young outfielder Albert Almora Jr. Originally promoted in June to take the place of the injured Jorge Soler, Almora hit well right out of the gate, but then slipped in July before being returned to Triple-A. He’s back now, and has suddenly driven in four runs over the last two games. Almora enjoyed a breakout at Triple-A, flashing more speed than ever while hitting over .300. He’s more than held his own in the bigs, and now that he’s starting to produce and is likely to get more at-bats down the stretch, he’s definitely worth a look in deeper NL-only formats. Must-own reliever Aroldis Chapman has been absolutely spectacular in his return to the NL after spending the first half of the season with the Yankees. He earned his first win as a Cub Friday by striking out the side in the top of the 10th and has nailed down his last seven save chances. Chapman was enjoying a stellar hit rate with the Yankees, but he’s been nearly untouchable since joining Chicago. He’s averaging less than an inning per outing, and using him in slightly shorter outings seems to be working. Overall, Chapman’s ERA has risen slightly from last season, but remains brilliant. He’ll again be one of the first five relievers off the board in your 2017 drafts. Now it’s your turn. Let us know in the comments below how you think the Cubs will do in this year’s playoffs. This entry was posted on Saturday, September 17th, 2016 at 11:13 am	and is filed under BASEBALL, RotoRob, Team report. You can follow any responses to this entry through the RSS 2.0 feed. Both comments and pings are currently closed.